When Yogesh Chaudhary isn’t overseeing his family business at Jaipur Rugs, one of the country’s largest manufacturers of hand-knotted carpets, he’s busy managing his portfolio of angel investments. Over the past three years, Chaudhary has backed more than 25 startups through Venture Catalysts, a Mumbai-based incubator and angel investor network. Chaudhary represents a growing tribe of high net-worth individuals from Tier II and III cities who now view angel investments as an attractive and viable way to diversify their investment portfolios from the traditional asset classes such as gold, public equities and real estate. Not surprisingly, most of these angels invest in technology sectors such as consumer internet, data analytics, augmented reality and software-as-a-service. “Startups are a very attractive investment asset class. High risk and high reward,” Chaudhary said in an interview with TechCircle. “Also, the learnings and networking are excellent if you spend some time (with the startups),” he added. Chaudhary started investing through Venture Catalysts, or the VCats platform, in 2016 and his current portfolio includes online eyewear marketplace ClearDekho, environment technology solutions startup Ambee and online gifting platform IGP. Overall, he’s invested about Rs 3 crore ($418,519 at current exchange rates) across the 25-odd bets. Since it started operations in December 2015, VCats claims to have partnered with more than 4,500 angel investors from Tier II and III cities. The platform typically backs startups at the angel and seed stages and investment ticket sizes range between $250,000 and $1 million. It has closed 102 deals so far, according to data compiled by Bengaluru-based startup research firm Tracxn. 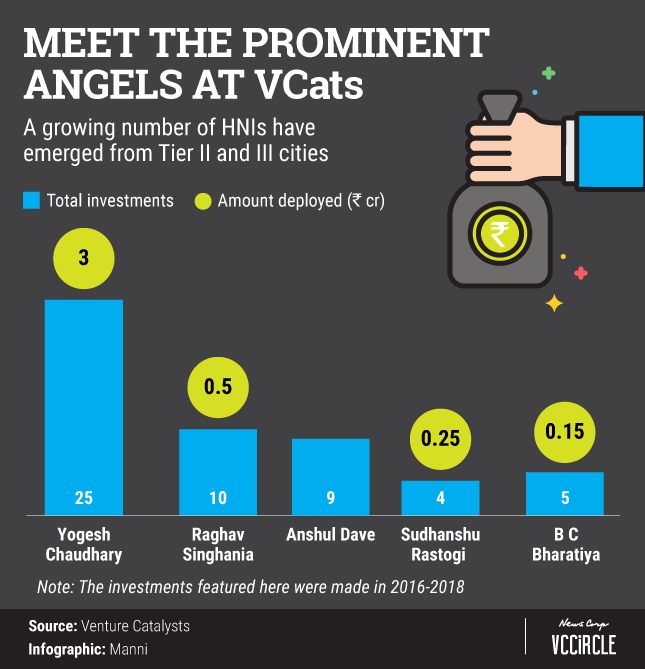 “Angels from Tier II and III cities see an underlying potential in startups that will multiply their money much faster while opening up opportunities for them to be part of a bigger picture," VCats founder Anuj Golecha said. Jaipur Rugs’ Chaudhary tops the list of investors on the platform in terms of the number of deals closed. He’s followed by Raghav Singhania who manages a family-owned iron and steel trading business in Raipur, Chhattisgarh. For Singhania, investing in upcoming startups that are creating innovative solutions has deeper value beyond just monetary returns. In fact, when he had an opportunity to exit two of his investments, he decided instead to top up his investment. “The returns from angel investments are manifold, unlike from investments such as the public markets, mutual funds and real estate,” he said. So far, Singhania has put close to Rs 50 lakh to work across 10 startups through VCats. His portfolio includes augmented reality startup Kalpnik Technologies, bike rental service ONN Bikes and energy drinks maker Fyre. Besides Chaudhary and Singhania, another angel who’s made bets via VCats is wealth manager Anshul Dave, who is also from Raipur. He has invested in nine startups but did not disclose the amount he put into these firms. He’s already booked three exits. “My returns from these three exits are in multiples of 6.5X, 5X and 4.5X,” he said. While he declined to disclose the names of the companies, he said that they are from the payments, SaaS and education sectors. “Nowadays, HNIs want to allocate 10-15% of their entire portfolio or even more to high-growth technology-driven startups. Even stock market investors are preferring startups,” he added. As part of his work, Dave also manages fundraising for listed and unlisted companies and is a wealth adviser to several family offices. Lucknow-based Sudhanshu Rastogi, who is in the real estate business, had a similar view. “I have been an investor across asset classes for 30 years. As an investor, I see that every 3-5 years, new instruments come up for investments. 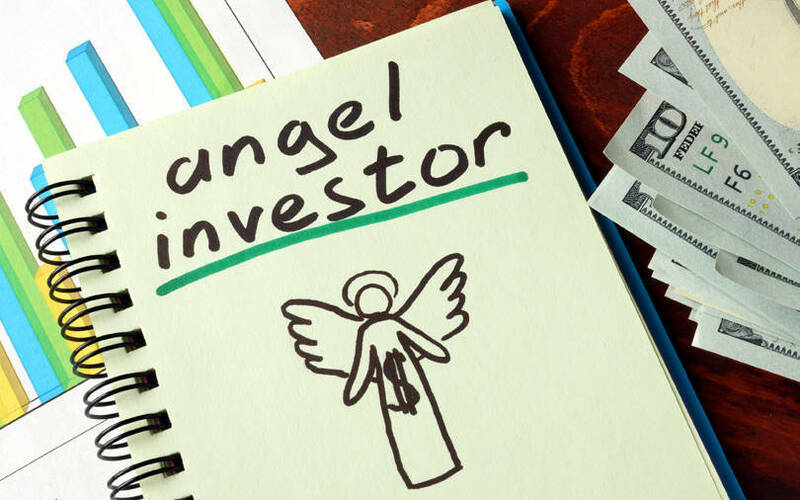 Angel investments are very fresh and don’t come with time limits. India’s startup ecosystem is at a nascent stage in Northern India and I am really happy to join at this early stage,” he said. Rastogi has invested about Rs 25 lakh in four startups, so far, including restaurant procurement platform Adurcup, gifting firm IGP and crowdfunding platform ImpactGuru. BC Bharatiya from Nagpur, who is chairman of The Confederation of All India Traders, has invested close to Rs 15 lakh in five startups. He believes that angel funding has become inevitable for startups as they look for someone to bail them out of the debts in the initial operational periods when revenues are slim. His five bets are ClearDekho, car washing services company CleanseCar, healthcare startup Hospals and Ambee. Since starting operations, VCats claims to have helped startups raise a total of Rs 261 crore ($36.5 million) from its partner angel investors. Between 2016 and 2018, VCats backed startups have gone on to raise follow-on funding worth Rs 673 crore (around $95 million) from external investors.